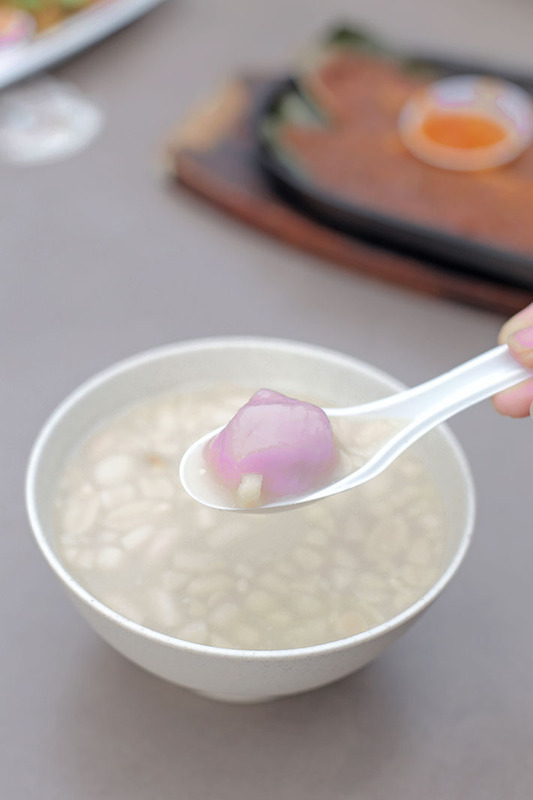 Tang Yuan—also known as Glutinous Rice Dumplings—is a Chinese dessert traditionally eaten during the Winter Solstice. It is made from glutinous rice flour that is mixed with a sprinkle of water shaped into a ball that encases different types of fillings such as peanut paste and sesame paste and then allowed to cook in a sweetened soup. Nowadays, it is commonly found in many Chinese dessert shops and people can have it at almost any time of the day. While there are many places that serve a comforting bowl of tang yuan, one of the best places for a good value-for-money bowl of homemade sweet treats would probably be 75 Ah Balling Peanut Soup. 75 Ah Balling Peanut Soup began as a simple pushcart stall along Jalan Sultan and has since made a name for itself and now has 2 outlets in Singapore. We headed down to the one located in 85 Fengshan Centre (commonly known as Bedok 85 Food Centre) on a Thursday evening and there were already people enjoying their bowl of tang yuan at 5pm. We got ourselves a bowl of their signature Ah Balling Peanut Soup (S$2.80), which comes with 6 balls of handmade tang yuan—each stuffed with a generous amount of filling—that sits in a bowl of thick and silky peanut soup. You can choose between 4 different soup flavours such as Peanut, Ginger, Almond Milk and Longan Red Date Soup but the best among all would have to be their signature peanut soup. The balls are all handmade from scratch daily and they are prepared by hand without taking the easy way out. You can literally taste the difference when you bite into these soft and bouncy delights! A bite into these delicious balls of goodness will send an explosion of flavours into your mouth, with a variety of flavours that do well to coat the tongue. The skin that encases the fillings was soft but not too chewy, which allows the fillings to ooze out easily as you take a bite. While we love all the different flavours that they have, the red bean ah balling took us by surprise and impressed us most due to it being not overly sweet yet maintaining a rich, velvety texture.